By a stroke of good luck my wife was called for jury duty last week. I have never understood why most people in Manhattan hate being called for Jury Duty. I suppose if you are self employed (although I am) or have outstanding warrants jury duty is not ideal. Otherwise, why fight it? You generally do not spend more than two days on Jury Duty. By law your employer has to let you go and still pay you. You can bring the Times or a good book and stretch out and get some reading done. You are done by 4:30. And the best part is you have an hour for lunch. Why is the lunch hour so great? Because you are in the midst of one of the most vibrant immigrant communities in New York, Chinatown. Walk out the doors of 100 Centre Street and the wonderful world of Chinese Cuisine is at your disposal. Roast Duck, soup dumplings, pork buns and more are yours for the eating. So when my wife asked me I if wanted to come downtown to join her for lunch, you know I said yes. I thought about where we should go and I suggested Nom Wah Tea Parlor. She happily agreed and away we went. Nom Wah sits on tiny Doyers Street, more of an oversized alley, right where it turns at a sharp angle. When Nom Wah opened in 1920 (originally at #15), Chinatown was just a few blocks, with Doyers at the center. Nom Wah survived the bloody history of Doyers Street and the massive expansion of Chinatown and is generally recognized as the oldest dim sum restaurant in Chinatown. Nom Wah Tea Parlor has not changed much in the last 60+ years. Wally Tang first went to work at the restaurant in 1950 when he was 16. He became the manager at 20, bought the place in 1974 and ran it until 2010 when he handed over the reigns to his nephew, Wilson Tang. A few upgrades were made, mostly to the kitchen, and Nom Wah seems poised to continue for another 50 years. The exterior looks like it hasn't been touched since the day it opened. The interior of Nom Wah is mostly unchanged, which is a good thing. It has a different feel than a lot of restaurants in Chinatown. It is a spacious room, with walls painted a bright yellow and the tables covered in red and white checkered table cloths. The old booths with their coat hangers remain. One of the highlights of the room is the large tea shelf, arranged with beautiful antique tea tins, tea pots and metal tea bins, a nice nod to the history of Nom Wah and Chinatown. The one big change at Nom Wah is how you get your dim sum. They no longer have the metal carts that go table to table. Now you have a full menu with descriptions and you fill out an order form at your table. The waiter comes and checks it and your food is made to order. The food is as solid as ever with some real standouts. We started our meal with the Cilantro and Scallion rice roll, warm and chewy with with the fresh bite of the cilantro and scallion. Next up was the House Special Roast Pork Bun, a bun the size of a throw pillow. The bun was thick but soft and lightly doughy. The filling, when you got to it, was generous, richly sweet and satisfying. Take a big, deep bite. Sometimes bigger is better. Shanghineese Style Soup Dumplings were decent, but the Shrimp and Snow Pea Leaf dumplings were home runs. The shrimp was firm and the snow pea leaf had a bright snap. Prepared open face with a thin wrapper, this is a dumpling where the filling is center stage and deserves the spotlight. In a lot of Chinese restaurants vegetables are a second thought or a mere accompaniment. Here they are listed under specials and rightfully so. 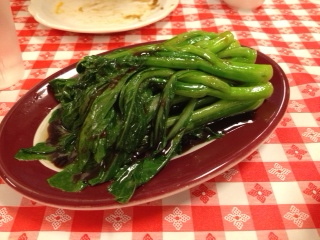 Chinese Greens (or Chinese Broccoli) with Oyster Sauce is a must. Stacked high on a plate, the fresh greens are perfectly blanched and served with just the right amount of Oyster Sauce. Even the most dedicated carnivore will find them addictive and find themselves digging in for seconds and thirds. 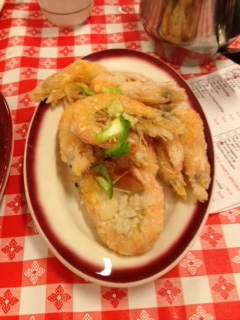 One of the other can't miss specials is Salt & Pepper Shrimp. Large, unpeeled shrimp are seasoned with salt and pepper than deep fried. Served with a garnish of jalapenos, the shrimp are crispy, savory and finger licking good. This is why we go for Chinese. Nom Wah Tea Parlor has been serving dim sum for over 90 years. Chinese culture teaches you to respect your elders. In the case of Nom Wah Tea Parlor, that respect is well deserved. Rice oil has a lot of advantages in comparison with other types of oil. Indeed, when taking into consideration the way it is produced, there are still arguments in the papers. Expository and persuasive essay writers for hire topics may be of great interest for those who want to learn more about food and drinks. Thank you for info! I`d like to know more about it! Maybe someday samedayessay will help you in writing new articles like this! Wanna know an alternative mention? look at this and start your discussion.